All cyclocross course are the same, right? Wrong! They all have certain basic requirements - fast off-road riding, obstacles, technical sections - but will vary significantly in the delivered product. They will also differ according to the type of ground and the facilities available. All of these things will change the way should prepare for each race. Here is a summary of the courses ridden for the Eastern Cyclocross League, in no particular order. If you wish to add something or correct me, please please let me know!. By the way, on a general note - Keep off sports pitches! If you see a marked out pitch (eg, football or rugby), please ride around it. The organisers are usually told to enforce this or face the penalty of losing the event next time around! The cycling centre is built on a hill-side, and consists of a long, sweeping road surface surrounded by grass and shrubland. The hill-side even makes cycling up some of the tarmac sections quite hard work. Away from the tarmac, the grass can get quite boggy - and the sticky mud will rapidly build up on unsuspecting frames! 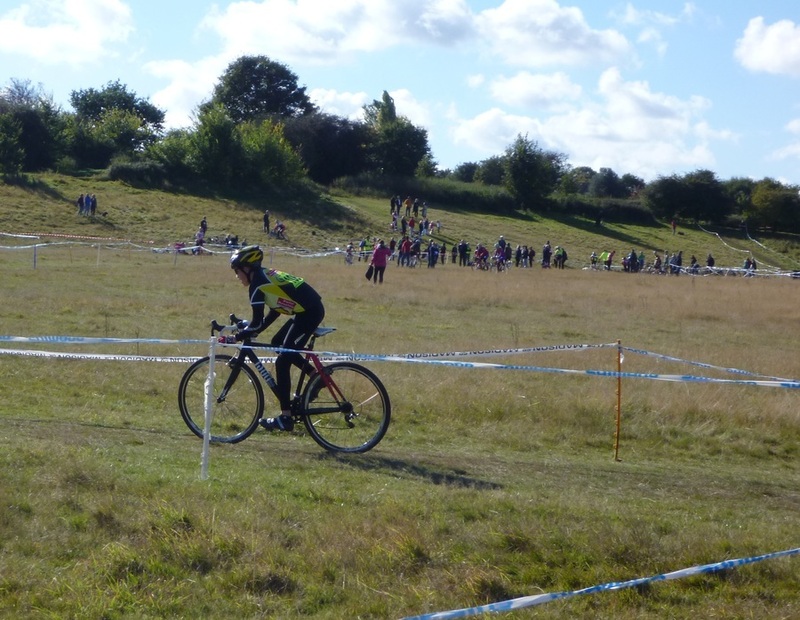 The school has an equestrian centre, and that is where most of the cyclo-cross action takes place. There is a lot of undulating grass, sections of dirt and tree cover, and a bit of road too. The HQ (at the school canteen) is 5 minutes walk from the start/finish area, and isn't on an obvious route - so do follow the signs! Gloucester Park is quite lumpy, and the organisers make full use of the sharp gradients. You'll need a good spread of gears - probably double-ring on the front - to spin up the climbs and roar down the descents. It is all on grass, and lower parts of the course will get churned up if there's been a lot of recent rain. Overall it does appear to drain quite well. Toilet and cafe facilities are at the Sports Centre, which is a good 5 minutes walk from the course - and these facilities can get quite busy! This is an almost entirely flat course, with one large lump of dirt to break things up for the older riders. Lots of reverse-camber turns on this entirely grass course make lower tyre pressures essential. Recent rainfall will probably cause minor churning up, but it should all remain fully rideable. A good course for beginners. The Sports Centre HQ is quite close, but there is very little space available. A very hilly course set in dense woodland on the edge of a hill. It is well drained and never gets too wet under the trees - but there are a few short sections that can get a bit boggy. Tree roots, loose dirt and tricky climbs are the order of the day, with minimal respite from a couple of short and flat grass sections. Not recommended for beginners because of its roots and tough climbs! The HQ is very close, but parking is extremely limited. The main road is the only other option. Set right on the water's edge, the course even ends up on the beach a couple of times. The beach is at least very firm - unlike the rest of the course if there's been a lot of recent rain! The majority of the terrain is poorly draining grass, with some respite provided by the beaches, a bit of woodland and some tarmac pathway. If there's been a lot of recent rain, this course destroys bikes - beware! If you're a beginner or hate mud, watch the weather maps and avoid it if there's been a fair amount of rain. There is ample (pay-and-display) parking and a fantastic Activity Centre HQ, right next to the start area. This is a mildly lumpy, very fast dirt course set in heath and woodland. It seems to drain pretty well, so don't expect much mud trouble. A long straight road section is usually used as well, so overall you should probably ride higher pressures than usual. For once the most tricky part of the course is actually on the road section: a 180 degree hairpin turn at the end of a downhill! Take that too fast and you or your front tyre will slide off. Another place to take care is in the gravel pit, which is a flat area with very loose gravel at the edges; watch your pace and don't drift wide into the gravel! Beginners should be ok riding it, just watch out on the fast descents. The village hall HQ is a fair distance away, and you need to hack though the heath to get to the pit area. There is reasonable parking available, but will fill up. A very flat course, run mostly on soft grass, is deceptively energy-sapping. If there has been a lot of recent rain, a couple of the sections will get very churned up and you may be quicker running them. There is an excellent section of road which can be useful for cleaning your bike if it's raining and the course is getting muddy. The road section's hairpin turn is at the end of an uphill leg, and incorporates the verge to get sufficient turning circle. This course has the best located HQ of the lot, and you can watch the start (and a lot of the course) from inside if you're feeling feeble :) There is also tons of parking; just make sure that you approach the HQ from the western side. Broom Heath is an old sand quarry and is consequently quick draining. The course is mildly undulating and quite quick, with a couple of steep sandy & gravel climbs thrown in to slow you down. Most of the surface is firm grass, but beware of numerous tree roots in the wooded section: picking the right line there is essential. Beginners should have no problem riding this - just watch out for those roots! Ditchingham village hall is used for the HQ and is fairly close to the start and pit area; there's a lot of course between the HQ and start, though, so watch where you're walking! There's also quite limited parking, and the road outside the HQ is residential and quite narrow - so do park responsibly even if it means a bit of a walk! This course can be tape hell for the uninitiated; extensive use is made of the broad, flat grass plain, so most of it is taped off. It's extremely hard work for the spectators to figure out exactly where a rider is placed in the race, when they're zig-zagging on this long grass section. There are a couple of forays into the woods up on the (small) hill, and you need to watch out for roots and narrow routes between trees. Things can get a bit muddy, but the course seems to be mostly well draining and shouldn't cause any clogging issues. Beginners may struggle in places, but overall it's quite simple to ride. St Helena School is used for the HQ, and is quite close on the other side of a quiet access road. Just watch out for all the tape when getting across the grass plain to the start/pits area! There's 100% grass on this fast course, and it's mostly flat. There shouldn't be much churning up even after recent rain, as the park seems to be well draining. There are three different sets of steps though, so practice your bike-carrying skills! I'd recommend this for beginners, as there's nothing too hard. The HQ is very close - but not quite in view of the course. There's also limited parking, and it may be tricky finding somewhere considerate to park in the immediate (residential) area. The course is set on compact but well draining grassland, so consequently doesn't cut up much after recent rain. It is mostly flat, broken up by a bomb crater for a small bit of scrambling in the dirt and long grass. The indoor horse arena creates a great atmosphere, and riders really feel like they're on display as they negotiate the Showjumping-style obstacles. The indoor surface is a loose, pulverised rubber surface, and won't cause any mechanical issues. It's also quite pleasant to have the pits indoors! The HQ is very close, and the cafe overlooks the indoor arena. There is also plenty of parking, making this a perfectly compact and convenient venue.